Goodson Roberts died of wounds on the 29th July 1916. He is buried at the Cemetery Luissenthoek, near Poperinghe, Belgium. He is one of the men named on the Bottesford ‘church list’ of WW1 Servicemen, but is not one of those commemorated on the Bottesford War Memorial. Both he and his brother Albert are commemorated on the Memorial at St Peter’s, Redmile. Goodson Roberts was born in 1894 in Redmile. Named Thomas Goodson Roberts, he was usually known as Goodson. His parents were Thomas Roberts, a groom born in 1857 in Redmile, and Emma Holmes, born in 1864 in Freeby, Leicestershire. According to the census, in 1901 Goodson lived with his parents and three brothers, George William (aged 15), Albert Edward (aged 10) and Cecil (aged 1), at Rectory Lane, Redmile. Sadly his mother died in 1910 and the family was split up. According to the census, in 1911 his father Thomas Roberts was a patient at the Devonshire Hospital, Fairfield, Buxton, one of the Hydropathic Hospitals. He was described as a groom for the Grantham Mail Service, and as a widower. Goodson’s oldest brother, George William, was 25, single, a canal labourer, who boarded with Samual Hall in Grantham. His second brother Albert Edward, 20, was a Private serving with the 76th Royal field Artillery in Ceylon & India. His youngest brother Cecil, aged 10, was a boarded with the Henson family in Redmile. Goodson himself, aged 17, boarded with for the Singleton family at 5 Chapel Street, Bottesford, and worked for them as a farm servant. Thomas Goodson Roberts’ service record is very incomplete and damaged, only fragments remain. Before his disembarcation for France on 9th September 1914 in the British Expeditionary Force, he was living at Woolsthorpe by Belvoir. Goodson Roberts enlisted in Leicester and was a private in the Leicestershire Regiment. 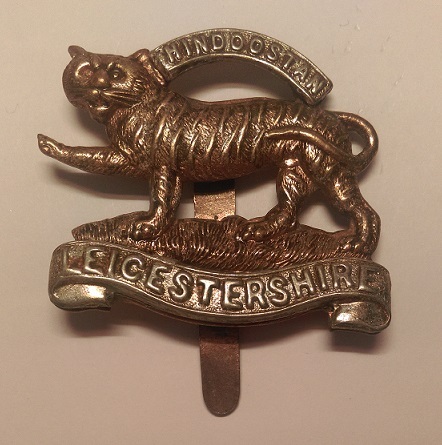 His Service Number was 9449 and he was in 1st Battalion, Leicestershire Regiment, serving with the British Expeditionary Force campaign in September, 1914. Goodson Roberts was injured on July 28th 1916 and died of wounds to the abdomen on the 29th July, 1916. He is buried at Lijssenthoek Military Cemetery, near Poperinghe, Belgium. The wording on his memorial tragically adds that his brother Albert Edward “also fell”. His brother William was advised of his death by letter from the chaplain to the Leicestershire Regiment, who described his time in hospital, adding that having arrived at the hospital unconscious, he recovered and was able to speak. According to the letter the doctors and nurses spared no pains in their efforts for him and that he passed quietly away. He was as brave a patient as could be. He was awarded the 1914 star and the Victory Medal and the British War Medal. Interestingly the article states that Private Roberts was with the Leicestershire Regiment before the declaration of war. It may be that he was confused with his brother in that his Medal Index card does not record any service prior to 28th July 1914. A document dated October 31st, 1916, stated “Any property belonging to the late Thomas Goodson Roberts to be dispatched to Mr William Roberts, 60 Norton Street, Grantham”. His medals were to go to the same address. There was a letter from the War Office stating that there were no personal effects, but in the Records of Personal Effects now available, Goodson Robert’s pay had amounted to £22.18s.7d (sent on October 31st 1916), £7 3s (sent on December 12th 1916) plus a War Gratuity of £11 that was sent on October 8th 1919. The form concerning living relatives that was sent to the next of kin of casualties was sent to Mr Thomas Goodson Roberts at Woolsthorpe, who confirmed that his wife had died and that Thomas Goodson Roberts had two living brothers, George (William) and (Charles) Cecil. Subsequently in August 1920 the forms were completed for the dispatch of Goodson Robert’s medals. They arrived eventually in July 1921. Goodson Robert’s father died in September, 1923. Goodson’s brother Albert Edward Roberts served as Driver 56089 76th Battery, Royal Field Artillery in Mesopotamia. He died on the 4th November, 1916 (though Redmile War Memorial gives the date as 29th July, 1916), during captivity after being taken prisoner at the surrender of the garrison of Kut-el-Amara on April 29th. He is commemorated at Baghdad (North Gate) War Cemetery. His obituary, published by the Grantham Journal on the 23rd December, 1916, states that he had already been serving with the army, in India, at the outbreak of the war.